Lawang Sewu is a famous Indonesia tourism. 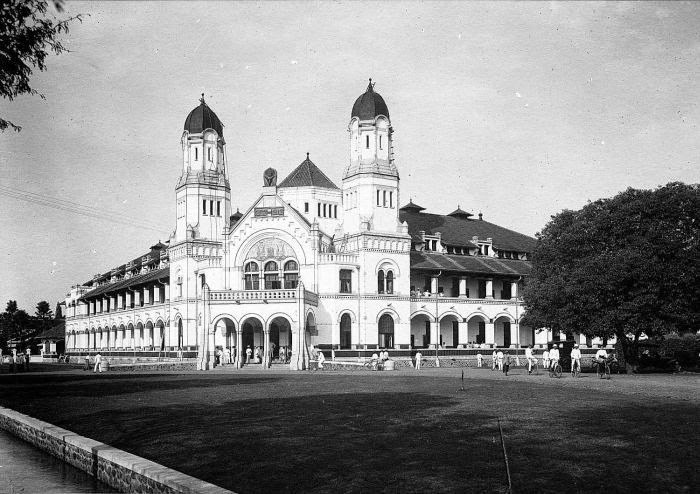 Lawang Sewu is located in Semarang, Central Java, Indonesia on Pemuda Street. Lawang sewu visited by local tourists and foreign tourists. They are very praising the architecture. Lawang Sewu was designed by C. Citroen, from the firm of J.F. Klinkhamer and B.J. Quendag. Construction began in 1904 with A building, which was completed in 1907. The rest of the complex was finished in 1919. It was initially used by the Nederlandsch Indische Spoorweg Maatschappij, the first railway company in the Dutch East Indies. By the way, the name Lawang Sewu is from Javanese, and it means "Thousand Doors". The name comes from its design, with numerous doors and arcs. The building has about 600 large windows. Lawang sewu is one of the cultural heritage objects heritage is protected by law about heritage. Because, lawang sewu supposed to have a significant contribution to building character of the society. Therefore, the lawang sewu must be preserved. The complex consists of several buildings, two main ones named A and B and two smaller ones named C and D, on Pemuda Street. The l-shaped A building faces the Tugu Muda roundabout. There are two identical towers on A building, which were originally used to store water, each with a capacity of 7,000 litres (1,800 US gal). The building features large stained-glass windows and a grand staircase in the center. There was also once an underground tunnel connecting A building to several other sites in the city, including the governor's mansion and the harbour. The B building is located behind A building. It is three stories in height, with the first two floors consisting of offices and the third holding a ballroom. The building, with high, large windows, also has a basement floor that is kept partially flooded to serve to cool the building through evaporation. In front of A building stands a monument to five employees killed during the Indonesian War of Independence. 0 Response to "Historical Place #4: Lawang Sewu Semarang"